The Barefoot Movement bluegrass band will perform at 7:30 p.m. Thursday, March 8, in W.M. Turner Auditorium on the SFA campus as part of the College of Fine Arts' University Series. NACOGDOCHES, Texas - Nacogdoches bluegrass fans have a unique opportunity to enjoy some of the freshest music on the bluegrass scene when The Barefoot Movement performs at 7:30 p.m. Thursday, March 8, in W.M. Turner Auditorium on the Stephen F. Austin State University campus. Start your spring break celebration a little early with this Nashville-based group that has been heralded by CMT Edge as "one of the most promising bands on the bluegrass scene." The performance is the last in this year's College of Fine Arts' University Series. 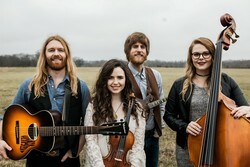 "When this up-and-coming, youthful quartet of superb musicians romps through pop-infused 'newgrass' medleys and country-flavored ballads, you can expect an evening of music with something for everyone," said Scott Shattuck, associate dean of the College of Fine Arts and director of the series. Billboard Magazine describes their sound as "slices of bluegrass, country, folk and even a little bit of rock and roll." In September of 2014, they received a Momentum Award, naming them "Band of the Year" by the International Bluegrass Music Association. They have been selected as showcase artists at both the International Bluegrass Music Association and the Americana Festival conferences and were first runners up at the 2013 Telluride Bluegrass Festival's New Band Competition. The group has enjoyed almost non-stop touring including a trip to Burkina Faso, Africa, where they were guests of the American Embassy. Already this year they have played from coast to coast, in venues from California to Virginia's Birthplace of Country Music Museum. "Their show is as fun to watch as it is to hear," said Shattuck, who saw them perform in a showcase at the Arts Midwest conference in Milwaukee in 2016. The "movement" can be traced back to the teen years of singer-songwriter and fiddler Noah Wall, of Oxford, North Carolina. Just as she had begun penning her first compositions, she met mandolinist Tommy Norris their senior year of high school. Convinced of their musical chemistry and driven by mutual ambition, they continued to build the band from the ground up throughout their college careers. While Norris studied classical music and recording engineering at Western Carolina University, Wall chose East Tennessee State, particularly for its Bluegrass, Old-time and Country Music Program. With the addition of versatile guitarist and singer Alex Conerly of Hattiesburg, Mississippi, in 2013, and most recently, Katie Blomarz of Frankfort, Illinois, on the upright bass, the lineup was complete with all the elements that make up the Barefoot sound: lush harmonies, thoughtful instrumentation and memorable melodies, according to information at www.thebarefootmovementofficial.com. Over the past seven years, The Barefoot Movement has appeared in Country Weekly Magazine, RollingStone.com, Music City Roots, and Woodsongs Old-Time Radio Hour. Their original music was featured on the Outdoor Channel's program "Huntin' the World: Southern Style," and their music video for their popular song "Second Time Around" has been seen nationally on the Zuus Country Network. The band's University Series performance is sponsored in part by Commercial Bank of Texas. Prior to the performance, artist, musician and SFA Professor Emeritus Charles D. Jones will present an informative talk at 7 p.m. in Griffith Gallery. The gallery is located across the hall from Turner Auditorium, which is inside the Griffith Fine Arts Building, 2222 Alumni Drive. Tickets for the University Series are $25 for adults, $20 for seniors and $10 for non-SFA students/youth. Tickets for SFA students are $3. For tickets or more information, visit finearts.sfasu.edu, stop by the Box Office in Room 211 of the Griffith Fine Arts Building, or call (936) 468-6407 or (888) 240-ARTS.